Happy February. Today we’re talking with Shelley of Day Dreams ‘n Designs. She was kind enough to answer my scrapping and somewhat off-the-wall questions. I started out designing blog train freebies in 2014 and then opened my first store in April 2015. 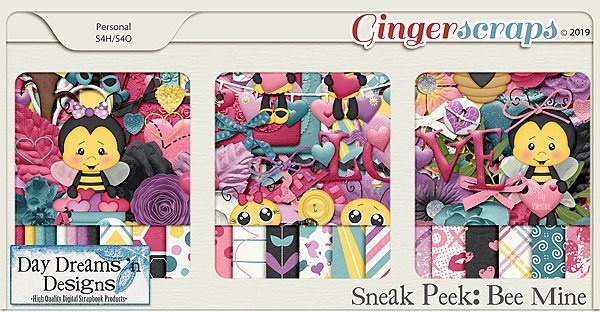 I started with a guest spot at GingerScraps in November 2017 and love being a GS designer. I had started digital scrapbooking a fews years before but then found some tutorials on how to design my own stuff. After participating in blog trains I found out how much I really enjoyed it. I have my own office with a large u-shaped desk that holds my PC and two monitors and my Mac Computer. And yes I use it all! My kids and what I need to scrap for them along with colors and themes. A Snowy Adventure has always been one of my favorites. I love doing snow kits because I love snow but I also love the color palette. My first job was at a place call Sears Teleservice. We answered calls from people wanting to schedule repair service for Sears appliances. Take my family on a cruise. Hmm, I don’t really watch talk shows but recently some of my favorite songs have been from Imagine Dragons so let’s go with them! Find iphone, Messages, and overdrive – gotta have my ebooks and audiobooks! Hands down cooking and then cleaning. But I hate cooking more. Hmm that’s a tough one but probably to the future to meet my descendants and see what it’s like. We only stream so we don’t watch commercials but my kids like that shark song and that gets stuck in my head a lot unfortunately! But water is my favorite thing to drink! I don’t drink soda any more but my favorite was cream soda so I’ll go with that. Thank you to Shelley for playing along. Make sure to check out her GS Store, her FB Fan page, and her blog. Also, make sure you are grabbing each piece of the daily download from the GS blog.